I had high hopes for Arbitrage, which had its premiere at the 2012 Sundance Film Festival. 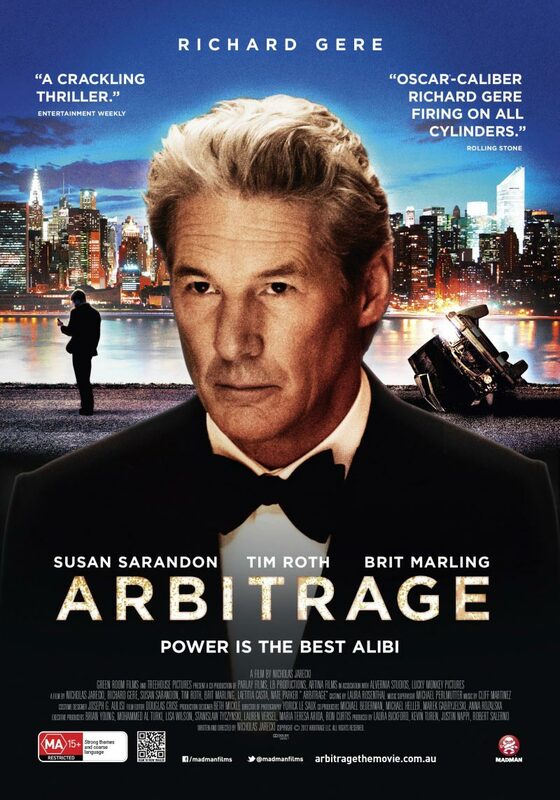 Although the film doesn’t fail in any of its individual elements, Arbitrage just isn’t very memorable. Despite its lack of exceptional greatness, the cast delivers, and the plot’s suspense will keep you focused. Arbitrage tells the story of millionaire businessman Robert Miller (Richard Gere) as he tries to sell his seemingly profitable company. However, things take a turn for the worse; he’s soon involved in an accident resulting in the death of his secret mistress all while his company is being audited. Despite going bankrupt, Miller must deceive the auditors into thinking the company’s still profitable in order for it to sell. With his reputation on the line, he must keep it all together for the sake of his family and company. Theres just one problem: Detective Bryer (Tim Roth) is hot on his trail. Can Miller do it all without getting caught? Two plots exist in Arbitrage. One involves Miller trying to sell his company while not getting caught for fraud. The other surrounds Miller’s attempt at not getting caught for having been involved in his mistress’ death. Separately, each is mundane and unoriginal, but together, the plots make for several suspenseful moments. Just when you think Miller’s in the clear with one plot, the other plot takes over. This teetering effect will keep you guessing till the very end. Above all Arbitrage revolves around money, often insinuating that life does as well. There are only a few moments when Jarecki’s screenplay will make you chuckle, adding a lighter vibe to the film. For instance, a character informs millionaire Miller that he’s buying an Applebee’s, to which Miller asks, “What’s an Applebee’s?” In another instance, Miller offers money to keep a character from testifying. The character explains that money won’t help, but Miller explains, “What else is there?” There’s even a tense scene when a big business deal is being made, and afterwards, the two parties discuss how low or high they would’ve bought/sold for in a joking fashion. These humorous, light-hearted, and truthful moments portray the true value of money. While neither the plot nor the script is particularly challenging, all of the actors definitely deliver. Richard Gere serves well as the slick, money-hungry, super-businessman; he makes us irritated with his character’s decisions, yet you’ll end up empathizing with the family man. Brit Marling plays a convincing daughter to the man whom she later discovers is behind the company’s fraud. Her realistic approach to the character had me questioning my actions: Would I turn in my father if I discovered he had done something illegal? And for that, she is commendable. Nate Parker and Tim Roth both deliver two of the film’s best performances. Parker serves as a great “kid from Harlem,” which he’s often referred. He’s rough enough around the edges but without portraying the disrespectful and uneducated hood-rat the police want him to be. Parker portrays the character in a respectable manner when speaking to the police and courtroom. As a result, his character comes off as someone who wants to help without getting himself in trouble. Parker’s filmography includes The Great Debaters and Spike Lee’s newest film, Red Hook Summer. The young actor has such a great ambience about him. 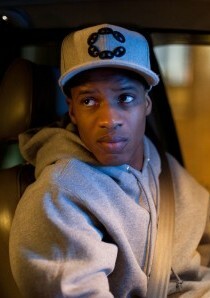 I’d be interested to see him in several of his upcoming projects. Academy Award nominated Tim Roth, most famous in my mind for starring in several Quentin Tarantino films, is probably the best actor of the bunch. Byer truly is the perfect detective; he’s sharp, cunning and witty, all attributes I typically do not associate with the everyday cop, which gives him an edge. Bryer is relentless, and serves as a good villain, one who you can also root for. After all, the man he’s pursuing is guilty. Overall, Roth was a great casting choice for Bryer. I would certainly never hope to cross paths with a detective like that. What’s Arbitrage’s main downfall? All together, the film’s unmoving and easily forgotten. I didn’t leave with a sense of satisfaction. It’s just an ordinary film. The film has a solid concept but fails to go deeper, which, in my mind, is unacceptable for movies now-a-days. I‘m an economics major, and there a few moments in the film that even I didn’t understand. When explaining to his daughter what happened with their funds, Miller goes on a tangent, which includes several business specific terms. He mentions “variation margin” (just look up the Investopedia.com definition yourself, oy vey). Even the title of film is an econ term. When trying to figure out just how such a business savvy man could’ve gone so wrong, his explanation just isn’t clear. I realize that the characters in the film probably knew what they were talking about, but, as an audience member, I felt excluded. Overall, the film is satisfactory, but fails to go above and beyond. Arbitrage is like the kid in school who only does the bare minimum to get by; it does what it needs to, but doesn’t deserve the same rankings as the more ambitious films in its genre. Arbitrage is entertaining and by no means bad. Here’s the bottom line: there’s nothing to take away from the film. Every movie has a golden opportunity to capture audiences for a solid two hours without interruptions. If you’re willing to take time out to watch a movie, there needs to be something that sticks with you. Unfortunately, Arbitrage just doesn’t have that. While it offers a suspenseful and resolved story, it’s definitely for an older crowd. For most people I’d say skip it, but if you really want to rent it, it’s not going to disappoint you.